Reflecting the author's extensive work with dogs, this book promises thorough explanations of topics, and proven behavioural strategies that have been designed, tested, and used by the author. 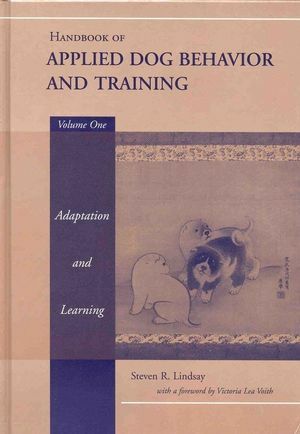 More than 50 figures and tables illustrate this unique and significant contribution to dog behaviour, training, and learning. Steven R. Lindsay, MA, is a dog behavior consultant and trainer in the Philadelphia, Pennsylvania, area, where he teaches handling, training, and behavior modification based on ethological principles. He also conducts seminars and is the author of numerous articles. Mr. Lindsay evaluated, handled, and trained highly skilled dogs for the U.S. military. 3. Neurobiology of Behaviour and Learning. 5. Biological and Dispositional Constraints on Learning. 8. Aversive Control of Behavior. 9. Learning and Behavioral Disturbances. 10. Human-Dog Companionship: Cultural and Psychological Significance. "The most valuable publication about dogs since Scott and Fuller's classic text, Genetics and the Social Behavior of the Dog, published in 1965." "The objective of giving a scientific account of all aspects of learning in dogs has been accomplished to a very high degree. ... No other comparable scientific texts are available."